Special thanks to Hotel Jen Penang for extending this food review invitation. Special offer: Mention "PenangFoodForThought25%" when ordering to get 25% discount off the regular price. The Mid-Autumn Festival (中秋节) is celebrated on the 15th day of the 8th month on the Chinese lunar calendar. This year, the festival falls on 24 September 2018. In conjunction with this auspicious occasion, Hotel Jen Penang is rolling out 8 types of mooncakes to delight its customers. 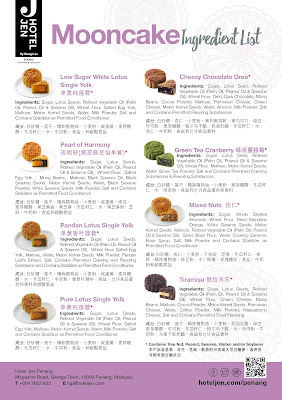 Hotel Jen's mooncakes are priced at RM38.00 each. 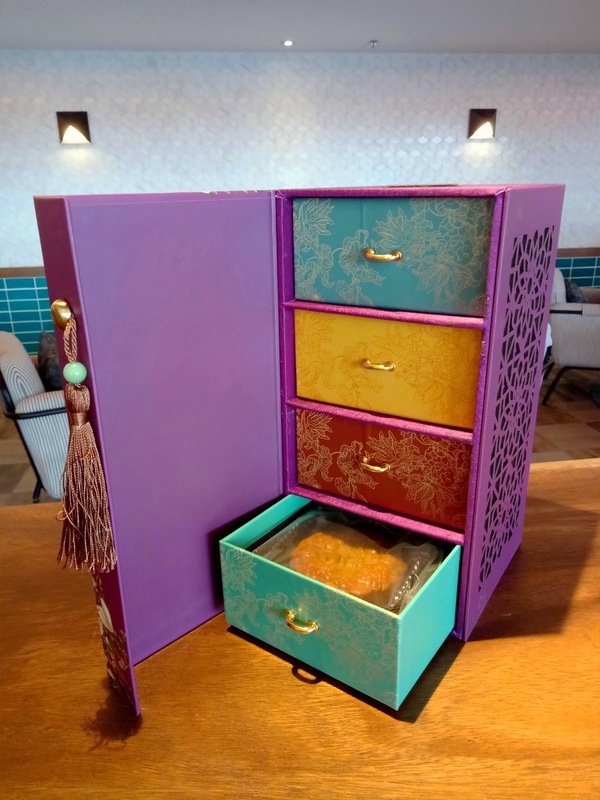 However if you order 4 pieces of any flavor (RM145.00), the mooncakes are encased in a stylish Jen Mooncake Gift Box. The maroon box has floral designs on the front and traditional Nyonya motifs on the sides. A dainty Chinese tassel is fastened to its magnetic lid. Inside the Jen Mooncake Gift Box is a vertical arrangement of 4 compartments that each contains a mooncake. The box's elegant design makes it very attractive to ladies because it can serve as a fancy storage box for jewelry. If you are looking for an ideal gift for this Mid-Autumn Festival, I cannot think of a better suggestion. The Jen Mooncake Gift Box also comes with Hotel Jen's specially designed tote bag. 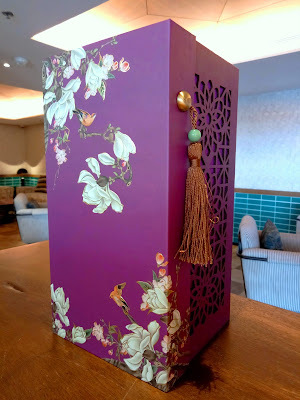 This unique mooncake packaging is only available at Hotel Jen Penang; other Shangri-La properties use different designs in their mooncake offers. 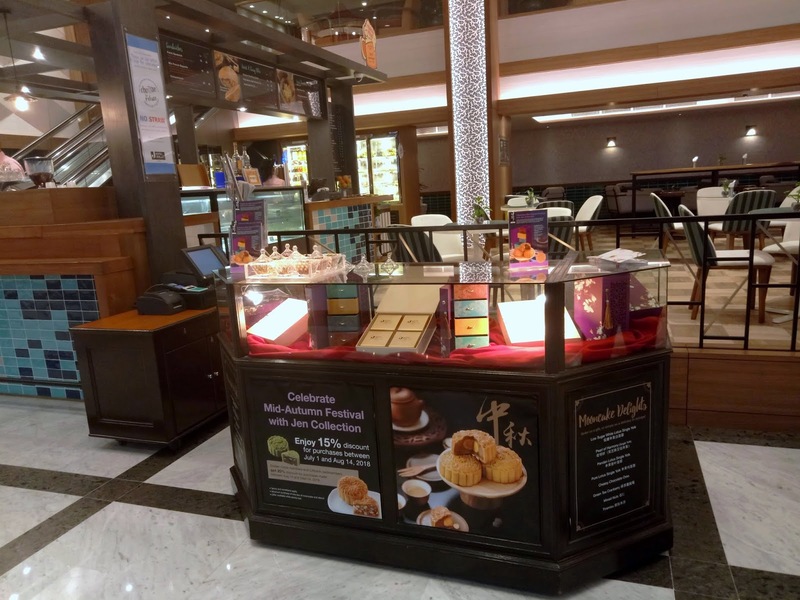 To enjoy these delicacies, simply visit the mooncake counter at Hotel Jen's Lobby Lounge between 10:00am and 7:00pm daily. 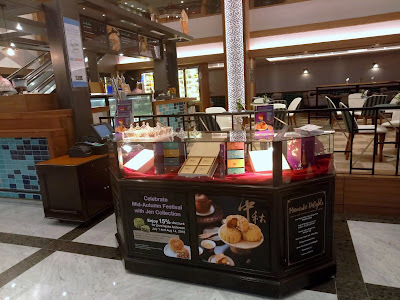 The counter is usually well stocked with all mooncake flavors. But just to be safe, I recommend that you place an order by phone (04-262-2622) or email (fb.hjp@hoteljen.com) before dropping by. 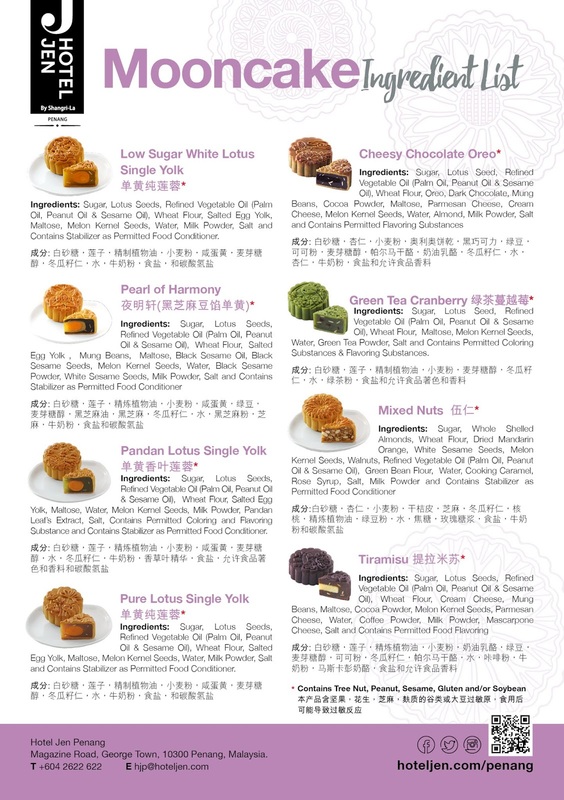 This mooncake promotion is available from now until 24 September 2018. Note that Hotel Jen's mooncakes comply with halal requirements. I am proud to announce that Hotel Jen is offering a whopping 25% discount to my readers (minimum purchase of 1 box). 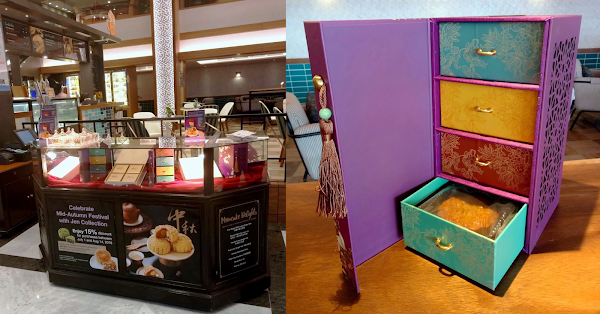 This means that the limited edition Jen Mooncake Gift Box is only RM108.75 after discount! To indicate that you are my reader, simply write "PenangFoodForThought25%" on the order form below or mention "PenangFoodForThought25%" to the staff member at the counter. 1. Like Hotel Jen's Facebook page or Instagram account. Or both, why not? 2. 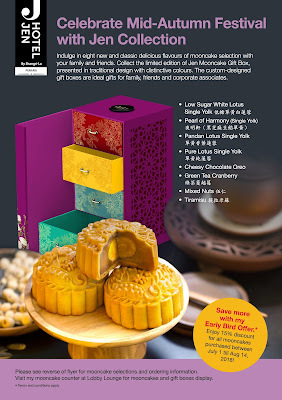 Purchase the Jen Mooncake Gift Box (RM108.75 after discount). 3. Take a creative photo or video with the mooncakes. Share it on your Facebook or Instagram account. Or both, why not? 4. Tag 2 friends in the post. 5. 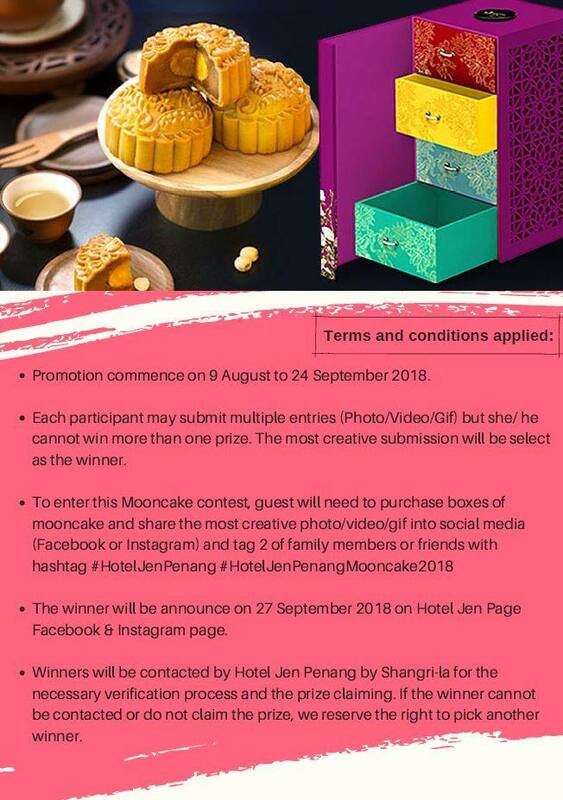 Include the hashtags #HotelJenPenang and #HJPMooncake2018 to notify Hotel Jen. 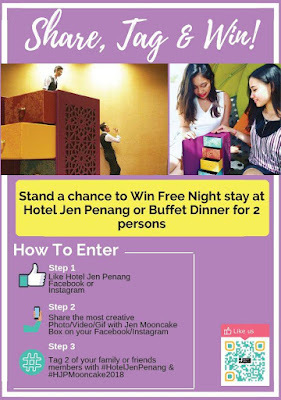 The most creative entry wins a 2D1N room stay at Hotel Jen. 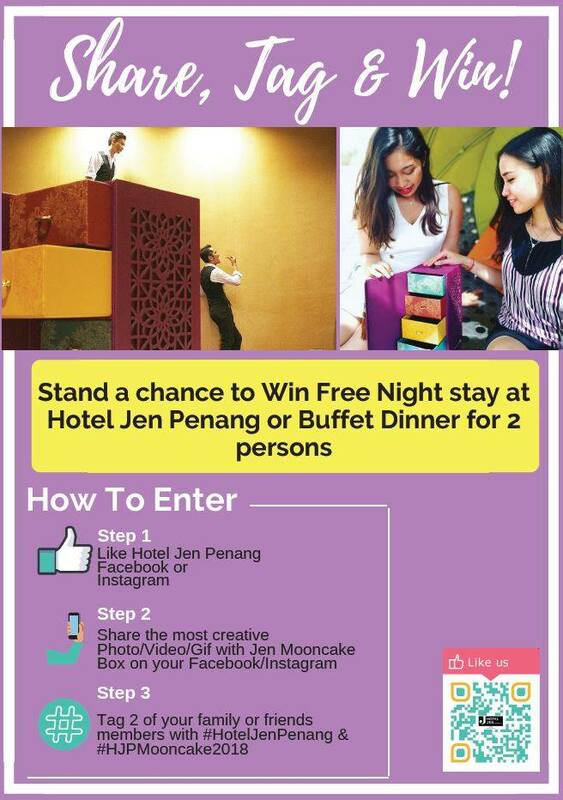 There are also 2 consolation prizes; each prize is a buffet dinner voucher for 2 persons at Café Jen. Multiple entries are permitted, so let your creative juices flow! More information on the contest is available here. 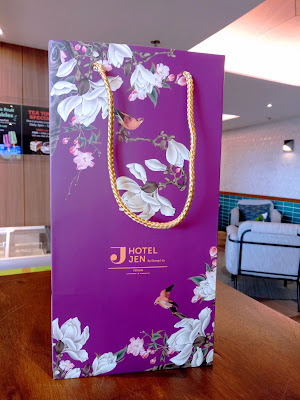 Finally if you wish to know the latest happenings and promotions at Hotel Jen Penang, please check out its website at www.hoteljen.com/penang. In case you are not a member yet, be sure to join Shangri-La's Golden Circle program for free! Directions: Hotel Jen is located at Magazine Road (Jalan Magazine), next to 1st Avenue Mall and just opposite of The Wembley. Lobby Lounge is located at the Ground Floor. The hotel provides parking in its basement levels.